The most important role a leader owns is setting and executing strategy. Strategy can be made to be simple, practical, and most importantly dynamic. 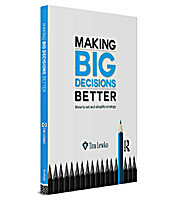 In Making Big Decisions Better, best-selling author Tim Lewko offers a field-tested and proven strategy system that you can use to quickly Fix, Build and Use your strategy and guide you to think about, develop, and execute your strategy better and more simply. Simplifying strategy ensures that your company will deliver better financial performance through better decision making. 4 ways to immediately fix and create a more powerful strategy. 3 powerful tools great leaders use to develop strategy and make tough choices. 3 must-have areas for setting sound strategic goals. 7 criteria to pressure-test the strength of any strategy.